Paris climate negotiators wrangling over global temperature goals might want to spend a moment pondering cheap gasoline. Fact: after years of steady gains, average gas mileage of new vehicle purchases in the U.S. is down almost a mile per gallon this year, according to data from the University of Michigan’s Transportation Research Institute. Fact: Through September, total miles driven in the U.S. this year are up 3.5 percent ― the largest increase in decades. One thing is driving both trends: cheap gasoline. The average price of gas sold in the U.S. over the past ten months is 25 percent below last year’s price — the steepest drop in at least 70 years. Americans are responding by driving more and dumping sedans for SUV’s and pickups. Gasoline consumption is on track to rise nearly 3 percent this year. The additional carbon dioxide will be the equivalent of a full year’s emissions from nine coal-fired power plants. (My yardstick is 600 megawatts per plant, operating at 70% capacity factor. See note at end of post for link to calculations.) And that doesn’t count the substantial “upstream” emissions from refining crude oil into gasoline. Can we be sure this year’s increase in gasoline use is entirely due to the drop in price? Not completely. But the inference is strong. First, gasoline usage is at least mildly price-sensitive. Based on gasoline’s long-run price-elasticity, a 25 percent drop in price would touch off a roughly 10 percent increase in usage. The entire jump in demand wouldn’t be seen overnight, of course; it would take a decade or so for the lower price to work its way through car buyers’ purchase decisions (as well as manufacturers’ design choices). The 3 percent uptick this year is in line with what one would expect in the initial year. Second, U.S. gasoline consumption stayed within a fairly narrow band from 2008 to 2014. Prices at the pump held steady as well, except during the worst of the great recession. What’s different this year is the plunge in price. 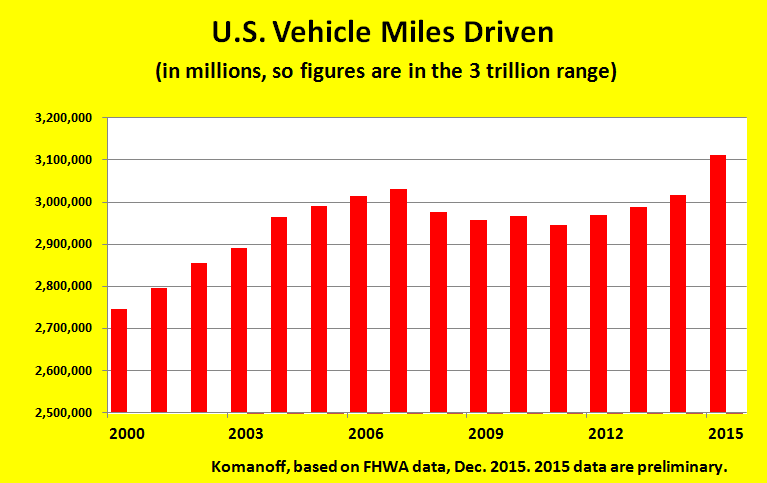 U.S. miles driven are on course to rise 3.5% in 2015. This year’s jump in CO2 emissions is bad enough. What’s really worrisome is that cheap oil — hence, cheap gasoline — is going to be with us for awhile. So say the experts who prepare the government’s Annual Energy Outlook forecast. I recently compared the 2025 forecast gasoline price between the 2012 AEO, which preceded the price collapse, and the 2015 AEO, which reflects it. Correcting for inflation, the government is projecting a 29 percent lower price of gas in 2025 than it projected three years ago. When you run the lower price forecast through the price-elasticity for gasoline, you get this startling projection: in 2025, U.S. motorists will buy — and burn — nearly 13 percent more gasoline than would have been expected under the earlier (higher) price forecast. The associated increase in U.S. CO2 emissions in 2025 because gas will be cheaper is going to be huge: it equates to the annual output of 36 coal-fired power plants. But let’s not stop there. Cheaper crude oil is bringing not just cheaper gas but cheaper diesel and cheaper jet fuel. I’ve run the reduced 2025 AEO price forecasts for all petroleum products through their respective price-elasticities, and the result is truly scary: Compared to projected 2025 emissions with the pre-plunge price trajectory, lower petroleum prices will result in 450 million metric tons of additional U.S. CO2 emissions in that year. The increase will equal 8-9 percent of today’s U.S. CO2 emissions from all fossil-fuel burning. It will undo nearly all of the vaunted reductions in U.S. emissions since 2005. It will be the emissions equivalent of 100 additional coal-fired power plants. And that’s just for the U.S. The antidote, of course, is a carbon tax — either a straight-up carbon tax or a hybrid one that surcharges petroleum products. A surcharge would reflect non-climate harms from oil consumption like traffic congestion, also place a charge on oil revenues’ corruption of governance in the U.S. and the Middle East. Former U.S. Treasury Secretary Larry Summers wrote last January that cheap oil created a political opportunity for a carbon tax. We followed that here with First Tax Oil, Then Carbon. But to our knowledge no one has quantified how dire the need is — until now. Cheap oil will make a mockery of just about every scenario to move the U.S. and other countries decisively off carbon fuels. Except scenarios based on carbon taxes. Note: Calculations of increased oil consumption, resulting increase in CO2 emissions, and coal-plant equivalents, may be found in CTC’s carbon-tax spreadsheet model (Excel file). 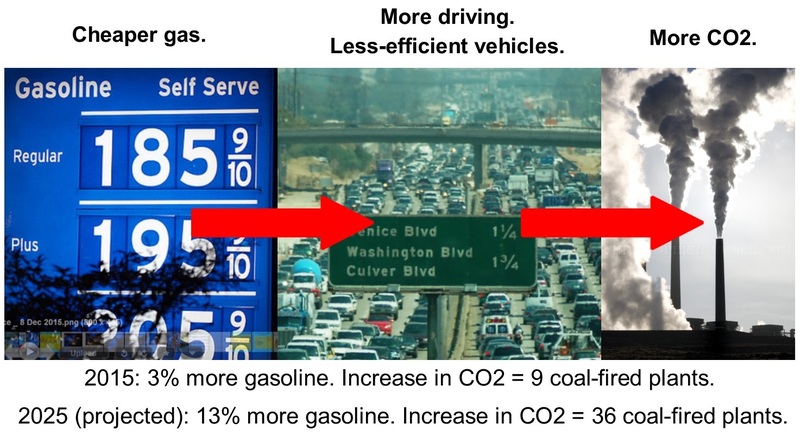 CO2 is food for plants, just plant more trees and you will have cleaner air! My concerns about carbon taxes diminish to insignificance if you talk about a petroleum tax or gas tax. If there ever was a proper time to push hard for a petroleum tax, it hasn’t been better than now. Based on the Saudi commitment to undercut unconventional oil production it seems like a safe bet that oil prices will remain low, and that U.S. interest in preserving cheap gas will be undermined. I think there is something of a states rights revolution brewing in response to congressional refusal to raise the gas tax, coupled with their pushing more costs off on the states. Of course cheap gas is helpful for the economy. But we sort of miss the point of the lesson in this article if we don’t acknowledge that the moderation of petroleum use around the world started and ended in response to the Great Recession. Or rather, it is ending. The economy is certainly not fully recovered. Please, though if you push for a petroleum or gas tax, also push for a reasonable fraction of it to be dedicate to direct funding of things which reduce consumption. I’m eager to see a large fund that is spent on the basis of cost-effectiveness. Whatever the project or process, based on the most carbon reduced for the least dollars or the most petroleum saved for the least dollars. 15% of the money raised by a carbon tax large enough to influence consumption would be enough to stimulate clean energy development like never before. @ Judy Mitz: Planting trees is a great idea But that does mean we shall not give care to reduce the air pollution. Co2 maybe food to plants, but planting trees alone won’t curb the pollution.